São Paulo is the biggest city in the Western Hemisphere, and its citizens -- Paulistanos -- are very welcoming of visitors. As Brazil’s business centre, there is a lot of English here, but the tourist won’t find tons of it outside of major hotels and restaurants. Don’t despair, a big smile and thank you in Portuguese (“obrigado” if you’re male, “obrigada” if you’re female) will get you a long way. A kiss on the cheek is a regular form of greeting in São Paulo, even for people who meet for the first time. Women will kiss each other’s right cheek, and men will kiss a woman’s to say hello and goodbye. The norm is just one kiss, though for some occasions some personalities will kiss more. Men, as you might have guessed, just shake hands. Many people bypass São Paulo for Rio or Iguazu Falls, but because the city’s Guarulhos airport is the biggest in South America, you may find yourself here regardless of the destination you’re aiming for. It’s worth getting out of the airport and exploring. Except for during the months surrounding the 2016 Olympics, many nationalities need a visa to visit Brazil, and the rules are quite different for different countries. For example, EU citizens don’t need a visa, but Spanish nationals have to prove they have sufficient funds for their stay and have proof of confirmed hotel reservations. The process to get a visa isn’t simple, either, often requiring a letter from your employer and three months’ worth of bank statements. Check Brazil’s Ministry of Foreign Affairs website http://www.itamaraty.gov.br/en/ and your own country’s visa rules site early in your travel planning. After you’ve arrived in São Paulo, logistics are easier. Getting a taxi from Guarulhos airport is smooth, as long as you’re not travelling at rush hour. The Guarucoop taxi company has a good reputation; find their desk in the airport, tell them your destination, and pay directly at the desk with a credit card. If you’ve arrived at a time when there’s unlikely to be traffic, a meter taxi is less expensive. Equally easy, and more environmentally friendly, is the airport shuttle for the 40 km drive to the city. Just outside arrivals, turn to your left and you’ll see the office of the Airport Bus Service. Tickets are 30 reais and the trip to several major city stops takes about an hour, traffic dependent. You catch the easy-to-identify blue and red bus just outside the ticket office. It leaves every 30 minutes during the day and every hour from 11 pm to 6 am. Jardins is an ideal neighbourhood for a first visit to São Paulo. The neighbourhood is a wealthy one, and one of the safest in the city. As the preferred home of São Paulo’s large expat community, you'll also find more English here. As implied by the name, there are many gardens and parks in the neighborhood, and it’s one of the best places in São Paulo just to wander. There’s a wide selection of shops, restaurants and hotels. Check in at WZ Hotel Jardins. This retrofit hotel has a unique night-time lighting system that interacts with air quality sensors. The LED lights are in cool blues, purples and greens when São Paulo’s air quality is good, and change to reds and oranges on the most polluted days. After checking in, explore the neighbourhood to get your bearings. For dinner, sample Brazilian cuisine. A traditional Brazilian dinner is a buffet with cooked-to-order meats. An excellent introduction to the foods of Brazil is at one of the À Mineira restaurants, a favourite of Paulistanos. There are several locations, the one in Jardins is at Al Joaquin Engênis de Lima 697. You pay one price to enter, and choose whatever you’d like from the buffet and from the grill. Drinks are extra. There isn’t tons of English, but you should be able to get by with hand signals and smiles. A note on buffets -- there are two types in Brazil. The all-you-can-eat type is called “buffet à vontade”, and the sold-by-weight type usually signed with “comida por kilo” or “self-service” (yes, in English). Both tend to be high quality in Brazil, unlike in most other countries. After dinner you could choose just to go to bed, but São Paulo is famous for its clubs. The hot places change often, but look for one with traditional live samba music. Ask at your hotel or consult Vejasp.com.br. You have lots of options -- São Paulo is one of the most LGBTQ-friendly cities in South America, so check transarte.net and their Facebook page for event updates. Breakfast should be at a local padaria or bakery, and there are tons to choose from in Jardins. While you should enjoy some of Brazil’s fruits via fresh juice or a smoothie, you’ll want to try a cup of coffee made from real Brazilian beans too. São Paulo was one of the world’s first coffee commerce centres, and it is because of coffee that São Paulo had such a multicultural population. Brazil is the world’s largest coffee producer, so coffee, especially espresso (called “cafezinho”), is a must here. A visit to Ibirapuera Park is an ideal way to ease into this bustling city. São Paulo’s Central Park is a huge green space and a slightly downhill walk from Jardins. With lakes, bike and walking paths, skateboard parks, playing fields and gardens, you can soak up São Paulo weekend life in Ibirapuera. It’s a popular place for pregnant women to pose for belly beauty shots -- keep your eye out for these happy mothers-to-be. Ibirapuera Park has several museums worth a stop to learn more about Brazil’s cultural heritage. Museu Afro-Brasil has over 5,000 works of art and historical objects in the collection and a regular rotation of exhibits. During my visit the museum showcased stunning black and white photography of indigenous peoples curated by Bahia-born artist Emanoel Araujo. As described by an opinionated map, "the museum recovers, preserves and promotes the historical and cultural universe of the Brazilian black community, always forgotten by the official institutions". Admission is free on Saturdays. The building was designed by Brazilian architect Oscar Niemeyer (who died in 2012 at the remarkable age of 104). Just outside is another of his works. Open on all sides and supported by just a few slim pillars, this gravity-defying space is popular with gravity-defying skateboarders and rollerbladers who perform tricks on its smooth pavement. Niemeyer’s buildings are throughout São Paulo, including the Memorial de América Latina which celebrates Latin America’s rise to freedom and the famously curved Copan apartment building (which was sheathed in blue for renovations during my visit, but still undulated beautifully). You can walk to Copan from Jardins (bring water or be prepared to buy drinks along the way in the summer heat). The bar in Copan, Bar da Dona Onça, has great Brazilian food. Samba is especially popular in São Paulo on Saturdays. Bar Samba in Vila Madalena provides both traditional food like feijoada and samba dancing. They open in the early afternoon, so you could go for lunch (and be assured of getting a table). Bar Samba is open until the wee hours, so take your pick of when to visit. Or, after last night’s traditional Brazilian food, how about something less traditional but no less authentic? São Paulo is a very culturally diverse city, in fact the largest population of Japanese outside of Japan is here. So, for a fix of great Japanese food, visit the Japanese neighbourhood Liberdade. If you visit on a Sunday, don’t miss the market in Liberdade’s main square too. If you’re wanting to scour the markets on Saturday, a Saturday market practically unknown to tourists is at Praça Benedito Calixto. It features antiques, handmade clothing, shoes and jewelry and unique products for the home such as mobiles made from recycled magazines. The food at this market is predominantly that of northeastern Brazil. Live samba-influenced chorinho music and dancing begins in the early afternoon, and the market closes down at 7 pm. Nearby is Teodoro Sampaio street which sells traditional musical instruments from Brazil. Clinicas subway station is nearest. After all that shopping you’ll need a break. Caipirinhas, made with the local sugar cane rum cachaça, are mandatory when visiting Brazil. Back in the Jardins neighbourhood, the bar at Tivoli São Paulo - Mofarrej hotel makes lovely traditional and passionfruit caipirinhas. They’re ideally sipped in the garden surrounding their orange pool. The bar has a delicious buffet of Brazilian snacks and live music Wednesday and Saturday afternoons. For a special dinner, head up the old-fashioned elevators at the Tivoli to the 23rd floor to dine at Arola Vintetres, a fusion of traditional Catalan food with Brazilian influences. The restaurant was created by Sergi Arola, the first Spanish chef to have a two-star Michelin restaurant. The views over the city are fantastic. Jardins’ main street, Avenida Paulista, is closed to vehicles on Sundays and full of locals and tourists enjoying the sights and sounds along the street’s 2.8 km length. In the centre of the street, separate lanes for bikes are marked off (carefully controlled at pedestrian crossings). 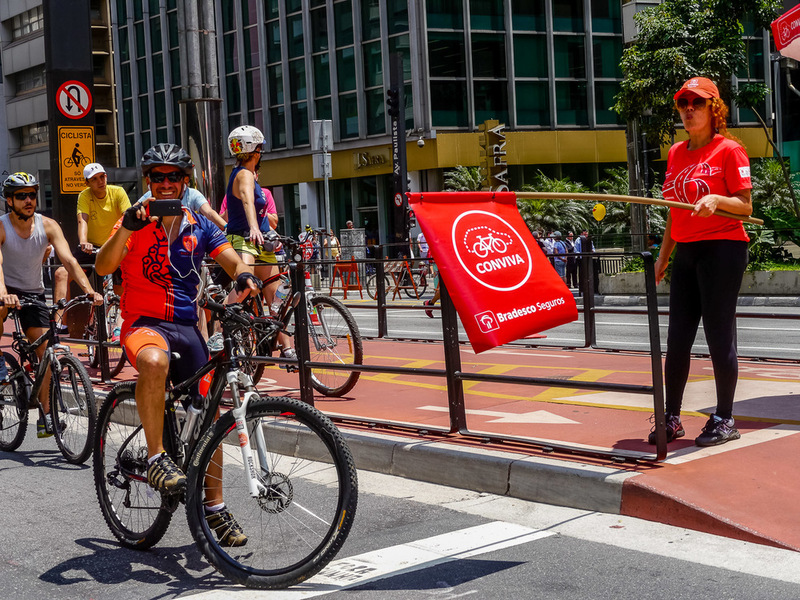 If you’re up for a bigger ride, São Paulo has 141 km of bike paths that are car-free on Sundays from 7 am to 4 pm. 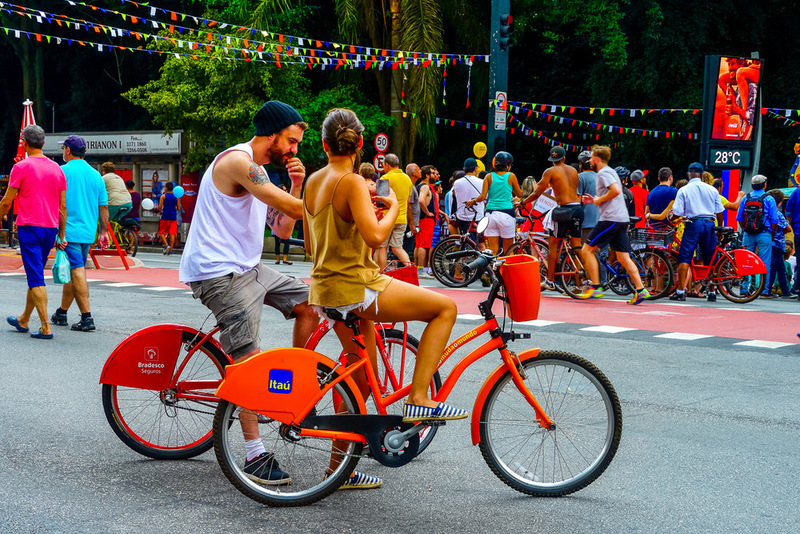 The “leisure cycling lanes” (Ciclofaixas de Lazar) have bike rental points throughout the city. You’ll find lots to see and do along Paulista, with an ever-changing array of street performers and street kiosks. There’s lots of food available for sampling breakfast and lunch treats. Be a little bit cautious with your belongings, as there are reports of cyclists grabbing bags and phones. If you're lucky enough to be in São Paulo in mid-May to early June, check dates to see if your visit coincides with the world’s largest gay pride parade (in 2016, May 29). It goes right down Paulista. Along Paulista, keep your eye out for historical buildings like the 1905 House of Coronel Joaquim Franco de Mello (Av. Paulista 1919), the oldest residence on the street. The white-sided red-roofed mansion has been graffitied, but is still beautiful. Escola Estadual Rodrigues Alves (Av. Paulista 227) was a refuge for combatants in the 1932 Constitutionalist Revolution, led by São Paulo, as well as the first public school in the region. The Museu de Arte de São Paulo (MASP) at Paulista 1578 holds works dating back to the Renaissance and is popular with Paulistanos on weekends. The building, with its red legs, symbolizes modern Brazilian architecture. If you’re here during the week, the collection is free after 5 pm on Tuesdays and Thursdays. On Sundays the area underneath MASP hosts an antiques market and across the street is a market with both handicrafts and food stalls. Across the street from MASP you’ll also find Parque Trianon which contains native forest trees and plants, playing kids, chatting adults, and canoodling young couples. This park is the last original coastal rainforest in Brazil, called the Mata Atlantica, so is worth a peek for environmental and historical reasons too. Stop into Teatro Popular do SESI, in the pyramid building at Paulista 1313. There are free theatre events and cultural displays here, and often fun things outdoors on Sundays (like a giant rubber duck during my visit). Asparagus, just off Avenida Paulista at Paulista 352 (down a short passageway), is a popular place for a vegetarian lunch. São Paulo is famous for its salad bars, and Asparagus has an exceptionally good one. You can eat as much as you’d like for 18.50 reais, including water, juice and desserts. São Paulo’s streets get jammed again starting Monday, so leave early to make sure you don’t miss your onward flight. Editor's note: The writer was hosted by Tivoli São Paulo - Mofarrej hotel, but all opinions are her own and no one from the hotel reviewed or approved the article. Take a socially conscious trip to Canada’s famous West Coast city with this guide.